Oh me, Oh my—this is the most delicious batch of black eyed peas that I have ever made. I just made up this recipe as I went and it turned out wonderful! I was in a rush to get to work so I threw it all in the crockpot!! Soak the black eyed peas in water overnight. In the morning rinse and drain the peas. Put them in the crockpot and add 6 cups of water and the 4 chicken bouillon cubes. Stir. Put the ham bone in and garlic. Stir again and set the crockpot to cook on LOW for 8-10 hours. About 3 hours before serving, take out the ham bone and let the meat fall off the bone into the black eyed peas. Throw the bone away. Add the chopped collard greens and cook for 3 more hours. Serve with cornbread. Note: I didn’t put any salt in this because the chicken bouillon and ham were salty enough. 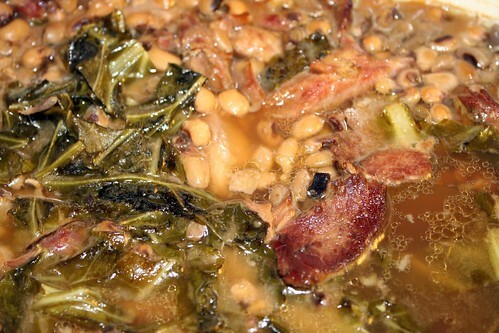 My family normally does not like collard greens but they ate it up in this recipe! Posted on January 1, 2014 January 1, 2014 by cookingwithpizazzPosted in Crockpot, Holiday, PorkTagged Food, New Year's, Pork, Recipe, Slow Cookier. Next Next post: Homemade Pizza-Best Pizza Ever!! !